This edition of Smile for the Camera is the 18th edition and the word prompt is Travel. 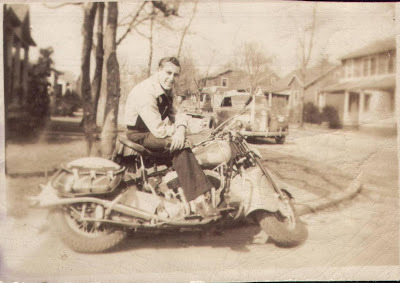 My contribution is a picture of my Uncle Morris B. Cooke(my Dad's brother) on his Indian Motorcycle. I'm not sure what year this was taken. My guess would be late 1940's/early 1950s. I believe the motorcycle would be a model made some time in the mid-40s. My Cooke family lived in Old Hickory, TN which was for the most part a company town built around the Dupont plant which opened there in 1918. All of those are wonderful ideas. I love my subscription to Family Tree Magazine as well as my Footnote.com subscription. Pictures of the six GG Grandparents( I have pics of 2 sets): Wm C. & Elizabeth Putman Cook, George & Catherine Morrow Jakes, David & Rebecca Manley Frizzell, Elisha & Keziah Rigsby Luna, David and Mary Adcock Pitman, Wm P. & Nancy Arminda Hitchcock Hale. These should all be fairly easy for Santa. After all, at one time he had to know where these people were in order to deliver Christmas goodies(or perhaps their lump of coal). 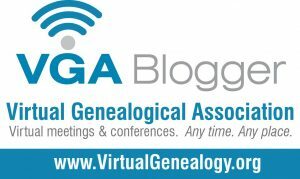 I read an article from the Terre Haute News entitled GENEALOGY: Confederate pension records out there for the asking written by Tamie Dehler. It has some good information for those researching Confederate soldiers but one section in particular caught my attention. "However, the National Archives has no Confederate pension records in its files. To order these, one would have to contact the state from which the Confederate soldier served." The last statement is not correct. To order PENSION files a researcher would contact the state in which the soldier or widow was living when they applied for pension. This wouldn't necessarily be the state in which the soldier served since the majority of states that granted Confederate pensions did not do so until 20+ years after the war(on average). I've done a bit of research using Confederate Pension Records mainly with Tennessee & Texas pensioners. Most of the TX Pensions I have worked with were for soldiers who had served in TN. See my Confederate Pension Abstractions for an idea of what is on the TN & TX applications. These application did vary in the questions that they asked even within the same state and year to year.